Random Anny .Com: New Contest! Congrats to Carolina on winning the contest! Announcing a snazzy new contest sponsored by Seventh Generation! Which of the Seventh Generation natural dish liquid varieties are you most interested in trying? Which essential oil sourcing site would you be most excited to visit, if you were to win the "Nature Makes Perfect Scents" sweepstakes? 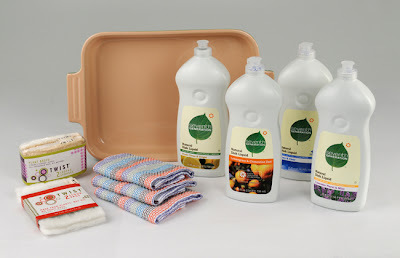 "Disclosure: The Seventh Generation Natural Dish Liquid prize pack, product and information have been provided by Seventh Generation through MyBlogSpark." Well definitely France since the Lavender Floral scent is the one that I would have chosen to begin with. I love the scent of Lavender and then when I saw with picture of the Lavender fields, well it's a no brainer! I want to try the lavender and mint! i definitely would try Lavender and Mint, though i really appreciate a Free and Clear option - i get overwhelmed by scents easily and it is nice to have a scent-less option. Fresh Citrus Ginger sounds yummy! I want to try the Lavender Floral & Mint. I would love to try the citrus and ginger soap! I would LOVE to try the lavendar and mint - my two favorite scents. I would like to try the Lavender Floral Soap-love the scent of lavender. It would be wonderful to visit France and see fields of lavender! The scent I am most interested in is Fresh Citrus & Ginger. I would love to go to Vermont. I have been once before and I loved it there. I love anything lavender so the Lavender floral for sure! the lavendar is the one I am most interested in trying. Lavender Floral and Mint sounds good. I'd love to try the Free & Clear. Sometimes scented dish fluid smells terrible when mixed with the food smells from the dishes, it would be nice to have unscented dish liquid. Thanks! I want to try the Lavendar Floral and Mint! I would want to visit France. I've never been. Sounds lovely. The Lemon and Ginger would be my choice--I LOVE lemon kitchen products, and ginger sounds like a great twist. Fresh Citrus and Ginger sounds lovely! I love ginger scents, and citrus leaves a nice clean scent when you clean with it, so this scent would be nice! Thanks so much. Citrus and ginger sounds so clean. Would like to try that one the best! Lavender and mint sounds so calming, I would love to try that one. I've heard so many good things about this dish detergent so thanks for the opportunity! Both the Fresh Citrus & Ginger, and Lemongrass & Clementine Zest scents sound lovely! Thanks for the giveaway- what awesome prizes! I would like to try the Lemongrass and Clementines!! Those smells always seem to perk me up!!! I would love to try the lavender and mint, lavender without chemicals sounds great. The source site is definitly Sicily though. Fresh Citrus & Ginger sounds like it my be fun to wash the dishes. The Lemongrass and Clementine Zest sounds wonderful to me! I'm interested in trying Free and Clear. It's hard to find stuff that doesn't have any scent. I'd like the lavendar floral and mint scent. I'm really interested in trying the Citrus and Ginger! I'd love to try the Lavender Floral and Mint! I would love to try the Lemongrass & Clementine! Oh my gosh clementine zest sounds amazing! So fresh! I would love to try the Citrus Ginger! Lemongrass and clementine sounds great! I love citrus-y scents! I'm most interesting in trying the Fresh Citrus & Ginger. Citrus & Ginger ALL THE WAY. I want to try the citrus and mint, and would love to go back to France!